It has beautiful views and its emplacement at the gates of the Natural Reserve of Sierra Magina makes La Casita a superb choice. 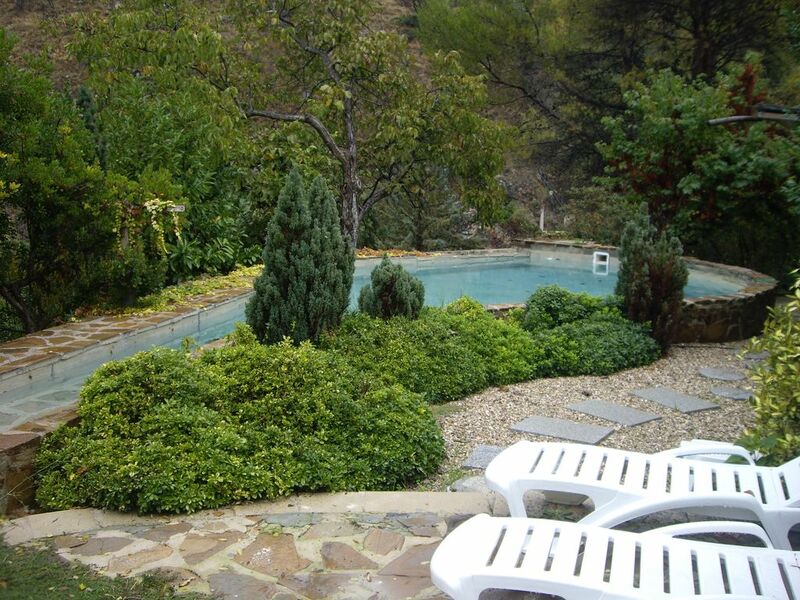 La Casita is a nice cottage placed in an outstanding environment,at the gates of Sierra Magina natural reserve and one kilometer away from Torres a pintoresque andalusian village. You can enjoy an atmosphere of quietude,peacefulness and calmness,only perturbed by the chant of birds and the water of the nearby waterfall. La Casita offers you a private garden which comprises a wide array of plants and even a Japanese-themed section.This garden provides an excellent micro-climate for relaxing and meditating. It also has a private swimming pool whose curious shape will definitely please you.Its dimensions are (9.5 meters*6 meters). There are two independent buildings set around the main terrace and porch.One building contains three bedrooms and one bathroom,it has a small garden on its top,this building has central heating. The other one contains a kitchen,a living room,a bathroom and a cellar,its heating is provided by a wood stove. In addition,La Casita offers a space for having barbecues (and all the neccessary equipment),free timber(for the stove) and parking place. Maison très bien équipée; pas de climatisation, mais pas nécessaire car très fraîche. Wifi ne fonctionne pas et pas de réseau 3G/4G. Familia encantadora y cuidadosa con las instalaciones.Los pequeños detalles se hubieran corregido de haberlos sabido. Hoy, he sustituido 3 de las 30 bombillas de los exteriores.En una estancia larga pueden surgir estos problemas y le pido disculpas. Un saludo afectuoso de Berna. Take the A-44 motorway and then the A-316 until you arrive at Mancha Real where you have to look for the road called JA-3106.After haven taken this road you will arrive at Torres,there look for the road called ''Carretera de la Fuenmayor'' after driving for around 1km you will find la casita on your left. You can visit the Sierra Magina natural reserve where there are many sightseeing routes.Torres which lies at 1.5 km is a protypical southern spain village where you will find shops,discos,restaurants and bakeries specialized in the regional cuisine.